Time for me to get back to regularly updating the blog….Where do I begin?? 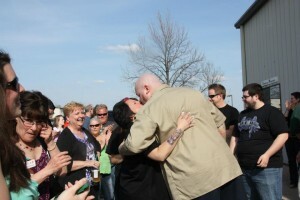 Well, I am proud to announce the Grand Opening of our brand new INK 180 Tattoo and Ministry HQ in Oswego, IL. We’ve been open for just about a month now and the business side of INK 180 has really taken off. I was out of commission for 2 months with a broken wrist so I’m playing catchup on the non-profit side with a heavy influx of cover-up needs. God is doing amazing things to change their lives and we’r blessed to be able to help play a role in that by covering these symbols that used to define them. People have been coming in to tour the facility, learn more about the ministry and get some new ink to help benefit the ministry side. Our shop is like no other tattoo shop that I’ve EVER seen. We run a Christian Business to provide a clean, friendly environment for those who choose to get tattoos. We realize that tattoos aren’t for everyone but we want those who love tattoos to have a great experience when they come in. We have been very blessed with the facility with everything from the city’s support, community support, help in getting the construction done and the business community in Oswego turning out to support our endeavors. We are Kendall County and Oswego’s FIRST and only tattoo shop and we will make them proud to have us here. If you’re in the area and would like to see the facility, get a tour or even a new tattoo, we are at 27 Stonehill Rd, Unit D, Oswego IL 60543. Our phone number is 630 554-1404 and the email is Chris@ink180.com. We’d love to meet you and show you what we have going on here at INK 180. I TRULY WOULD LOVE TO PERSONALLY MEET YOU IN PERSON AND TALK.